Fort-Myers.net is a Webpage for affordable vacation rental homes in Fort Myers close to the most beautiful beaches Florida offers. The online booking function is simple and mobile-device friendly. This is one of the last pages on the internet that don’t charge a ‘service fee’ or commissions. Instead those unnecessary extra costs you receive on top free rental bicycles. You will find here the best rates of comparable vacation rentals in same proximity to beaches. Make sure you give us a ‘like’ and save the bookmark. If you found this page by searching for the discount code "Fort Myers ICHWANTSPAREN" then you are at the right place! If you book online at this page you will automatically save paying for any service fees or commissions otherwise charged by most other pages. Online booking is here simple too! Simply click at the rentals units availability calendar on your arrival date and a small window will pop-up guiding you step-by-step through your online booking. Restaurants and shopping locations are in walking distance and the included bicycles are perfect for exploring different beaches. There are bike paths next to most roads, even to Fort Myers Beach and also in other directions, like to Bunche Beach or to Sanibel Island. • The “Beach-Trolley” drives back and forth from Summerlin Square to Fort Myers Beach about every 40 minutes and it costs about 50 cent per person. The Beach-Trolley and all other buses stop next to the Sunflower Cafe, which is the main bus-station and can even be reached by a short 15 minutes walk from your home. You can also park your car there for free and take the trolley or the bus from there. The updated bus-schedule can be found in the internet. Please Google “LeeTran”. There is even a bus driving from and to the airport from this bus-stop. • Restaurants – you can find restaurants like “Patabilities”, “Marco’s Diner”, “Osaka”, “Perkins” and also a smaller Café “Biscottis” within a short distance from this home. There are many other Restaurants located within a radius of a mile from your rental. These can also be easily reached with the included bicycles. If you are into alligator meat, you may like trying the restaurant “Gatorbites Tale & Ale”. If you prefer to have your breakfast or to dine at the waterfront, the “Gulf Shore Grill” Restaurant at the beach might be your choice. • Supermarkets – you will find a Publix supermarket in 1/4 mile walking distance, there is also a Super-Walmart in 1/2 mile south and a Super-Target Store in only 1/2 mile north from your vacation home. • Tanger Outlet Shopping Center – if you are interested in doing some shopping during your vacation, you can find the Tanger Outlets within a distance of 2.6 miles from the home. • The ”Smugglers Cove” Mini-Golf – is located about 1.2 miles (4 minute’s drive with the car) away from this rental. This place lets you play mini-golf within an interesting scenery where you can also see and if you like to, even feed alligators. • The ” Shell Point” Golf Course – is located 4 miles away from this home. Everybody is allowed to play golf at this course and beginners can do some practice at the teeing ground. 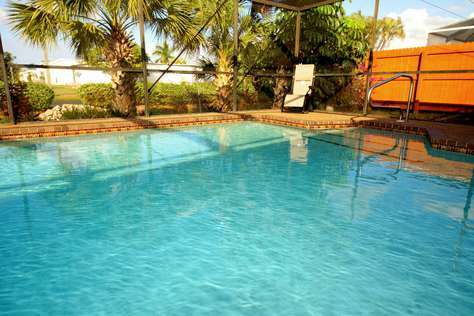 • The swimming pool at Fort Myers Beach Community Park – can be reached within a distance of 5 miles. This is a big community heated pool. If you are travelling with children, you might like to look for the smaller pool for children with its water slides. The living room comes with a 42 inch Smart-Flat-Screen-TV with build in Netflix. Additionally the TV is connected to a local amplified HD-TV antenna in order to receive all local live-TV-stations in best possible HD quality. If you like to be online with your own devices, such as your laptop, iPad or Smartphone you can use my free and unlimited Wi-Fi internet. For making a nice BBQ in the backyard or on your patio/deck you will find an electrical-BBQ-grill. You will be surprised how well it is working and relatively easy to clean up after. The kitchen is fully equipped with all kitchen ware, stove, microwave, refrigerator with freezer but no ice-maker, dishwasher, toaster & coffeemaker. This rental has a dining room with a large table where you can enjoy your home made meals. One the two bedrooms is equipped with a King-size-bed with light pillow-top-mattresses and offers spacious closet for your luggage and for your clothing. 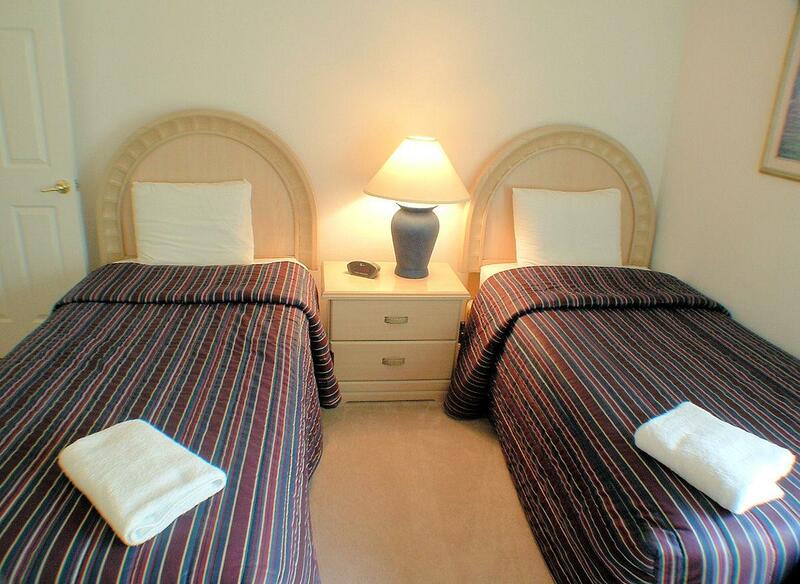 The second bedroom comes with two XL-Twin beds, which are longer than regular twin beds. If moved together they can also serve as one King-size bed. The living room has a large sofa and together with the large ottoman it can be converted into a bed for 2 adult. But keep in mind that I don’t supply bedding for sofas, only for beds. No worries of who is getting the better bedroom. All linens for beds in bedrooms are supplied. The bath has a tub/shower combination, a toilet and a regular vanity. The local cleaning lady supplies a hair dryer, two shower-towels per guest and a small start-supply of toilet paper and hand soap. Sorry, no any other towels or wash clothes. 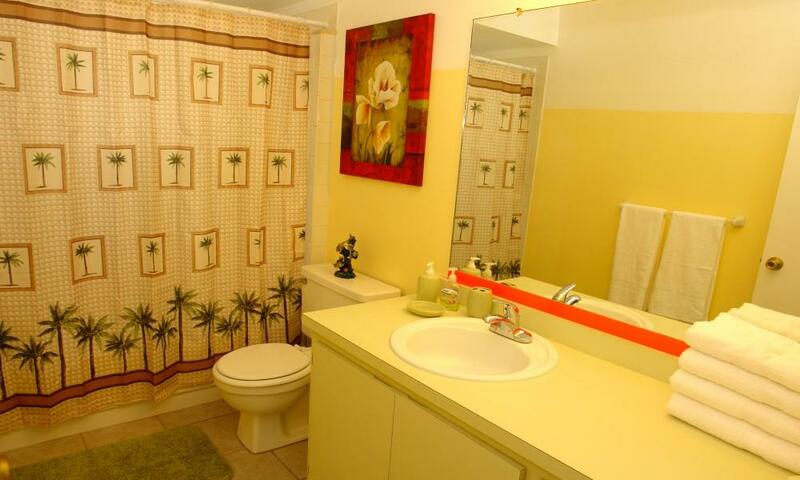 It is reflected in the lower cleaning fee compared to similar rentals. Please bring those items with you or purchase them locally at Walmart while you buying your first groceries. The living area has a central air condition with pre-programmed digital controller, which you can set with your smart-phone to your comfort cooling, based on the abilities of the cooling system of the home. Even it is rarely needed in SW-Florida, the rental has also a central heating system. For washing your laundry you may use, for free, our basic washer and dryer located for common use in a shed building next to the house. Please bring your own laundry detergent and softener. There are often left-overs from the prior guests but please don’t count on it. Other as in the neighbor city Cape Coral we have here in South Fort Myers and Iona plenty bicycle trails running mostly parallel to most of the major roads. I supply basic used bicycles for free because they are very useful to get you to the next beach and to explore the area. If you need helmets or locks then please bring your own as I don't supply those. The bicycles are stored in my central garage about 75 yards from your entry door. The home is located in an open community, away from all the traffic of main roads but still close enough to get to them all in just a few turns. Your entire living area is a ground level attached house with no other units above you. All floors are hygienic laid out with tiles. The patio has a screen enclosed deck with an outdoor dining set. You will find a BBQ-Grill, and a large swimming pool (nearby 100 yards) and a power heated hot-tub/spa with LED lights, jets, waterfall and seating for 4 people. Hot-tub and pool are accessible by 4 units. Around the backyard goes a 6’ tall privacy fence. You can find also tropical plants and other trees for a few shady spots. For maintenance I have different contractors to support you. For example weekly pool & garden care, final cleaning- and handyman-services. Together with the arrival guide you will receive a very detailed house guide. Arrival and departure days can be any day as long as it shows open at the availability calendar. Earliest check-in time can be 3:30 p.m. and latest check-out time 10:30 a.m. It is no problem to check-in late at night because we will supply you with the electronic lock code for the entry door. You will have available free parking for your cars in the driveway, in front of the building. 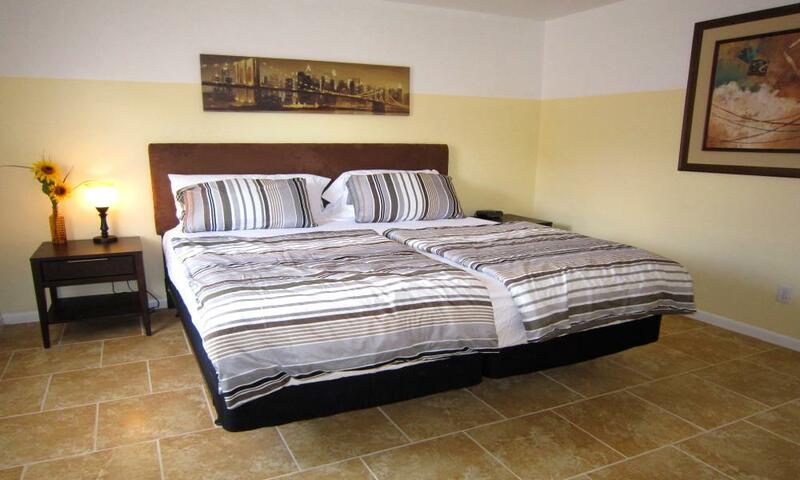 This property has 1 King(s), 2 Twin(s), 1 Day Bed(s). Overall, I had a great experience staying at BeachSummer. The condo is in a great location only 1 minute from the grocery store and shopping and only 6 minutes from Fort Myers Beach front. Upon arrival the condo was clean and the sectional couch and big screen TV with Netflix was very nice. My friends and I really enjoyed the screened in porch and hot tub at night and found the electric grill and washer/dryer facility to be very useful. Also the condo has a keyless code entry which is nice not having to keep track of a key. Owner was very nice and helpful as well. My only complaint was that one of the burners on the stove didn't work and this was only an issue because we cooked every night. But for the price, I was extremely pleased. I will be returning to this spot for future vacations. Owner's comment: Sorry about the burner. I wend over, took it out, put it back in place and it was working again. I think the cleaning had it placed wrong. My wife and I stayed in BeachSummer last visit, the year before in BeachSurf. Both locations are only a couple miles from Ft. Myers Beach and the Sanibel bridge. You will save an hour or more of travel time to the beach staying here rather than Cape Coral. There are several good restaurants close by, Lamotta's was my favorite, and Sunrise restaurant for breakfast, very good food, excellent prices. For grocery shopping, the Publix has the friendliest and helpful service I have ever experienced. BeachSummer and BeachSurf were roomy and clean and I was able to park my jet ski in the driveway. I would recommend a stay here if you plan on spending most of your time at the beach. If you cancel your booking 40 or more days prior arrival date then the cancelation fee is 20% of the contract total. 100 minus ‘two times the number of nights prior arrival date’ equals the ‘percent due’ of the contract total. If you cancel on or after the arrival date no refund is available and the entire rental charge is due and payable as liquidated damages. To hold your booking a 20% deposit is immanently required via credit card. The remainder of the rent is due 30 days prior your arrival date or right away if your arrival date is already within less than 30 days. For reservations with an arrival date more than 30 days ahead from the day of your booking you will receive latests 45 days prior arrival date an email with payment instructions. In that case the 80% remainder is due by either mailing a check or making Bank of America direct deposit or performing an electronic transfer, credit card or PayPal payment is not an option.